Pattern colour: Faint pale mark on head. Pronotoum: Sides strongly contracted to the obtuse but sharp hind angles which are hardly toothed. Leg colour: Reddish-brown or sometimes black. Status: Scarce. Local in southern England and south Wales, with a single Irish record from Cork. Other notes: Elytral shoulders angled between basal rim and elytral margin; interval without punctures at their base; outer two elytral intervals finely pubescent, especially towards the rear, apices not or little divergent, sub-apical sinuation strong. Wings present. Mendel, H. (1993). 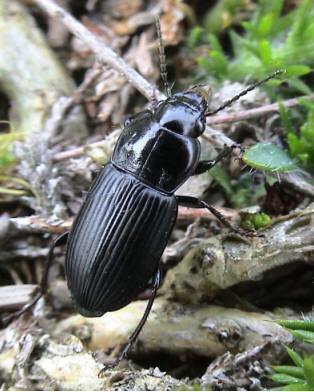 Anisodactylus nemorivagus (Duftschmid) (Carabidae), new to Ireland. The Coleopterist 2(2): 44.